Provided by the author. All opinions are my own. When we talk about literary world-building, usually the subject is a fantasy trilogy for adults. This is the first time I've seen a picture book to which the phrase was so very applicable. This pictorial book is a fascinating look at a circus with an inspiring story about perseverance. The stars have fallen and Meera's world has been whitewashed with the snow of deep winter. Meera's dream is to find the falling stars and return them to to the sky. She sets out on a journey and meets friends and foes along the way. The message she receives from the Dream Tree "Believe, Be brave, Shine" is one that is applicable to any tough situation the reader may find herself in. The book is infused with Kolpak's experience as a performer. It feels like a book of theatre stills- and the sense of movement is divine. When a picture book is illustrated, the artist can add little lines around the convey movement. 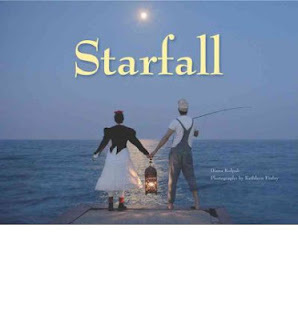 The acting skills of Kolpak and her fellow performers, coupled with the photography talent of Finlay ensure the reader feels the strain of the rower against a current or the difficulty of the fisherman pulling a hero out of the ocean. The lyrical quality of the prose adds an extra dimension to the fascinating and timeless photos. My kids were invested in every step of Meera's journey. This amazing book is truly one-of-a-kind. Check out the trailer and prepare to be drawn into a fascinating new world.